Six months ago I got this crazy idea. Why not leave the mothership? 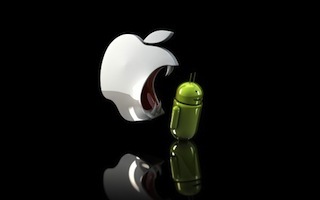 Give up on iPhone and try Android. This is what being tech-agnostic is about, I thought––not being wedded to a single platform. Besides, the iPhone’s digital keypad just wasn’t working for me. I got a monthly Boost Mobile plan, which uses Sprint. Service was stellar and I mean really good. I could call anywhere and always had a signal, even inside all these pre-war buildings you find in downtown Manhattan. How is this possible I thought? Service is one thing, but thats where the fun ends. A few months into Android hyperspace and I find myself grappling with a system that just doesn’t seem to understand what users want. On Android – first Samsung Transform Ultra then Sidekick 4G I found the app store was like wild, wild west. Buggy apps sat along well tested ones, and only a very discerning eye and mobile guru might know the difference. Syncing was absolutely horrible. The whole platform assumes you want to sync up with Google accounts. I went with Missing Sync from Mark/Space. My addressbook started getting corrupted, duplicate records appeared, syncs would fail halfway through. What’s more there were tons of started services I didn’t even use like Smart Navigation, Group Texting, and so on. These services seemed to run in the background, hog & bleed memory, and slow down my phone til it started crashing. I actually had to download an app called Easy Task Killer. Apparently a very popular app on the Android phones, I wonder why? Later on I found out that T-mobile was no longer supporting the Sidekick. No wonder it was so buggy. I can’t believe they’d ship something like this. I’ve long since quelled my desire for a physical keyboard. I was struggling with every other thing I would do with the device. Sometimes I’d just give up. I really wanted to get along with my Android phone but my experience with it only gave me an insight into three crucial areas where it falls short. People complain about Apple’s iron fist in app store approval. You can’t have it both ways. Android completely lacks discipline and users suffer hugely because of it. That weakens the platform. Developers building for Android must test on a huge spectrum of hardware. Smaller shops are likely to choose a few of the biggest ones only. Phones with a smaller user base likely have a lot of bugs just in the Android version they run. All this bodes badly as users just see buggy software, they don’t know why or how. This perception further weakens the platform. Building apps costs businesses money. Businesses must balance the costs of building features, test, debug, troubleshoot & release. That’s cheaper on the iphone because you have one device that is much more mature. This has a pile on affect as it strengthens the platform, users spend more on their devices, more users pile onto the iphone platform, so more money can be made building an iphone apps. On Android higher costs, lower margins further weakens the platform. This whole experience has brought me back to the iPhone 4S, and I have a whole new love and appreciation for the platform and the device. I also learned that sometimes less is more… much more!